Worry, doubt, confusion, depression, anger, and feelings of condemnation. . .all these are attacks on the mind. If you struggle with negative thoughts, take heart! The BATTLEFIELD OF THE MIND BIBLE will help you win these all-important battles through clear, practical application of God's Word to your life. 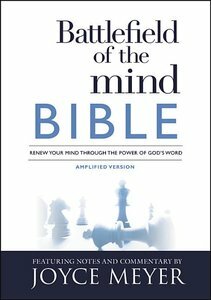 With notes, commentary, and previously unpublished insights by Joyce Meyer, this Bible is packed with features specifically designed for helping you deal with thousands of thoughts you have every day and focus your mind to think the way God thinks.